Richard Rowe, 31, of Blackgate Lane, Pulborough, was fined £120 and must pay £30 victim surcharge, £620 costs, after admitting driving without due care and attention on the A24 Southwater on December 19, 2016. He was disqualified from driving for 12 months. Kieran Gilbert, 18, of Ruskin Avenue, Bersted, was fined £120 and must pay £30 victim surcharge, £85 costs, after admitting driving without insurance in Chalcraft Lane, Bognor Regis, on May 6, 2017. Magistrates made no licence endorsement due to special reasons, saying he was misled about his insurance position. Nicholas Godfrey, 30, of Glebelands, Pulborough, was fined £120 and must pay £30 victim surcharge, £85 costs, after admitting drink-driving (49mg of alcohol in 100ml of breath) on the A29 Billingshurst on November 11, 2017. He was disqualified from driving for 36 months. Marcin Jaskulski, 34, of Lyon Street, Bognor Regis, was discharged conditionally for 12 months and must pay £20 victim surcharge, £85 costs, after admitting sending electronic messages that were grossly offensive or of an indecent, obscene or menacing character in Bognor Regis on November 10, 2017. Mark Shilton, 38, of Westward House, Fishbourne Road East, Chichester, was fined £120 and must pay £30 victim surcharge, £85 costs, after admitting drink-driving (122mg of alcohol in 100ml of blood) in Hunston Road, Chichester, on September 21, 2017. He was disqualified from driving for 12 months. Anzej Stasevskij, 24, of Argyle Road, Bognor Regis, was fined £250 and must pay £30 victim surcharge, £85 costs, after admitting drink-driving (90mg of alcohol in 100ml of breath) in Cavendish Road, Bognor Regis, on November 15, 2017. He was disqualified from driving for 22 months. He was fined £80 after admitting driving without the correct licence and admitted driving without insurance, no separate penalty. Mandy Watson, 52, of Arun Road, Bognor Regis, was jailed for 26 weeks and must pay £1,000 compensation, £115 victim surcharge, after being found guilty of stealing a £1,000 ring in Bognor Regis on April 11, 2017. Jean-Luc Kondabeka, 21, of Elizabeth Road, Chichester, was fined £375 and must pay £37 victim surcharge, £85 costs, after admitting drink-driving (50mg of alcohol in 100ml of breath) in Avenue de Chartres, Chichester, on November 18, 2017. He was disqualified from driving for 14 months. Jake Stone, 25, of North Street, Emsworth, was fined £300 and must pay £30 victim surcharge after admitting driving without due care and attention on Bury Hill, the A29 Bury, on July 12, 2017. His driving licence was endorsed with eight points. Martin Tims, 48, of Grayshott Road, Southsea, was fined £1,121 and must pay £112 victim surcharge, £85 costs, after admitting drink-driving (94mg of alcohol in 100ml of breath) on the A27 Chichester on November 19, 2017. He was disqualified from driving for 24 months. 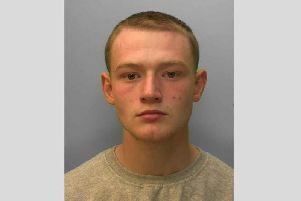 Marcus Cunningham, 24, c/o Summerfield Road, West Wittering, admitted breaching a community order and was dealt with for the original offences, receiving an eight-week prison sentence, suspended for 12 months, with Rehabilitation Activity Requirement and a restraining order for assault by beating in Chichester on November 3, 2017; and three eight-week concurrent prison sentences, suspended for 12 months, for two charges of assault by beating in Hampshire on August 29, 2017, and one of failing to surrender to custody at West Hampshire Magistrates’ Court on September 27, 2017. He was given an eight-week concurrent prison sentence, suspended for 12 months, after admitting assaulting a police constable in the execution of his duty in Chichester on November 3, 2017. He must pay £115 victim surcharge, £85 costs.